As you may know, my memories are very important to me. I love photos, I love looking back on my past and I love my lists lol. I have my happy book to document the things that make me smile and I have a bucket list of things to tick off as I go. Working in the job and being married to my husband has taught me to never let anything hold me back. To enjoy life, to experience it… Because I can… And because I deserve to. 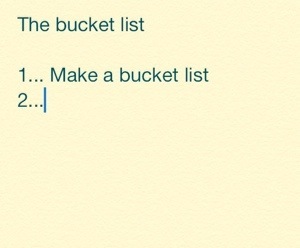 So it seems quite fitting to add to my bucket list… But I need your help. I’m not talking about lavish, expensive things… More the simple things like enjoying cadburys chocolate before giving into the world of Hershey’s *shudder* or milking a cow … Because why wouldn’t you when your best friend lives on a farm?? Or screw the weather lets go punting in cambridge… Because it’s almost local so why not? Of course I have Madame Tussaud’s (the waxworks) on mine because let’s face it it’s the only way I’m going to meet my boyband crush before I go so it kills 2 birds with one stone… But what would you do? I have 2 months left in England… Brits…what would you suggest I do? The rest of the world… What would you want to do if you visited England? Likewise I’m going to be limited to (probably) one year in North Carolina before moving to the next place so Non Americans…. What would be the little things you would want to experience/taste/see that we can’t do here? Or the bigger things you would love to do if you had the chance to go? And Americans… What would you suggest? I’ve heard about “trees” … Everyone keeps gasping about how beautiful the trees are…. I’m lost lol. So what is there around NC – or in America in General- to look out for and experience? So… If you don’t mind… I would love to have a few ideas (the more the better) from each of you of things to do on each side of the pond.